Inside, keep an eye out for cracks of any kind. Cracked sheetrock, floorboards and tiles are always causes for concern. Stubborn doors and windows that refuse to open or shut also indicate a potential problem. The outside of your home can also offer evidence of foundation issues. Check the foundation of the home, as well as bricks and siding, for cracks. Also look for gaps around doors and windows. The garage can also show deformation when foundation problems are present. 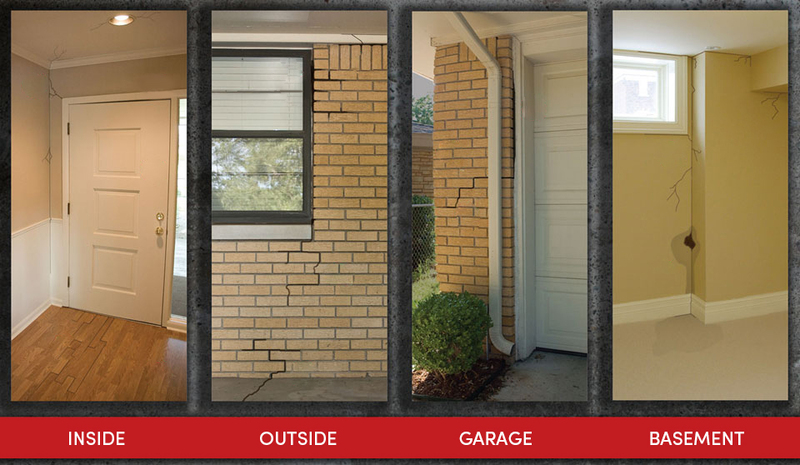 Be on the lookout for cracked bricks, warped walls and any separation between the garage door and ground. Because your basement is closest to your foundation, it’s often the first area affected. Check it for cracked or leaning walls and any possible flooding. There are a number of factors that put stress on your foundation. Unfortunately, most of them are out of your control. However, you can control how you choose to fix it. Give us a call today. We’ll be happy to apply our years of experience to your home’s or building's unique needs. Hot dry wind and intense heat will often cause the soil to shrink beneath your foundation. This change may cause cracks to appear throughout the structure. Tree roots may desiccate the soil beneath a home, causing the soil to shrink and the home to shift. Water from plumbing leaks can find its way under your home, eroding soil and ultimately compromising your foundation. Improper drainage is one of the leading causes of foundation failure. Excess moisture will erode or consolidate the soil and cause settlement. Insufficient steel and inferior concrete can contribute to movement in the slab. Soft, low-density soils and and/or improperly compacted soil beneath a home are the leading causes of foundation failure. Cut-and-fill situations should be properly prepared before the soil is ready to support a structure. Expanding and contracting soil can put added stress on your foundation and contribute to its failure.